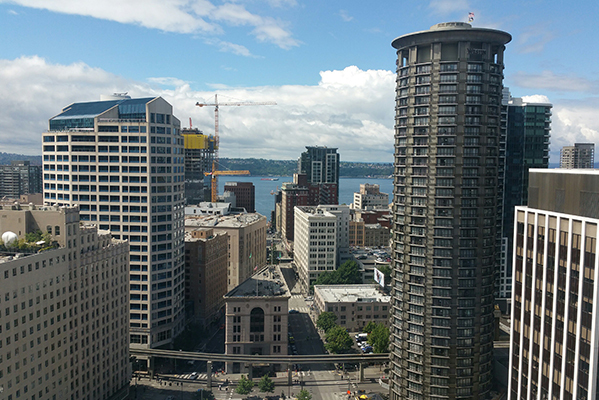 Our Seattle Downtown location provides stunning views from our office spaces and meeting rooms, as well as the rooftop terrace located on the 10th floor of the building. The incredible views include the Elliot Bay, the Space Needle, Lake Union, Mount Baker, the Cascade Mountains, and of course, Downtown Seattle. Seattle is home to the headquarters of big name companies including Amazon, Starbucks, Nordstrom, and Vulcan. The area is known for being a business hub, specifically of shipping, biotechnology, and medical research. 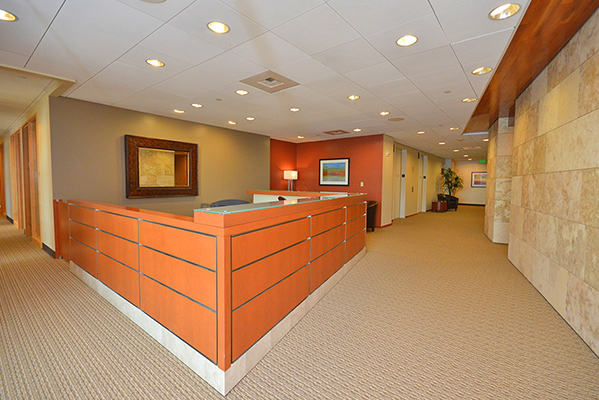 If your business is looking for an exciting and modern office location in Seattle, Premier Workspaces has the solution, whether it’s at this particular location, or one of our other locations in or around the Seattle area. For transportation, the Seattle Downtown building offers its own underground parking garage and street parking, and public transportation includes the Light Rail which runs between the Sea-Tac Airport and Westlake Mall. The Sound Transit, which is a bus, runs throughout the region with many stops within walking distance of the building. Our modern Seattle Downtown location lies between Stewart Street and Olive Way, nearby the I-5. The surrounding area offers shopping at the Pacific Place Mall and Westlake Center, and is near the Washington State Convention Center. The Sea-Tac Airport is located approximately 20 miles from the building, which is about a 45 minute drive. At the base of the building is located a Starbucks and a Blueacre Seafood. A cafe exclusively for tenants is on the 10th floor. Also, the well-known Pike Place Market is about 7 blocks east of the building and offers a variety of speciality, locally sourced foods and is the original farmers market in Seattle. In addition to both short term and long term office space, Premier Workspaces also offers hourly and day offices to accommodate any business need. Our full time offices include top of the line furnishings, along with high-speed internet, personalized telephone answering service with voice mail, and mail handling and distribution. 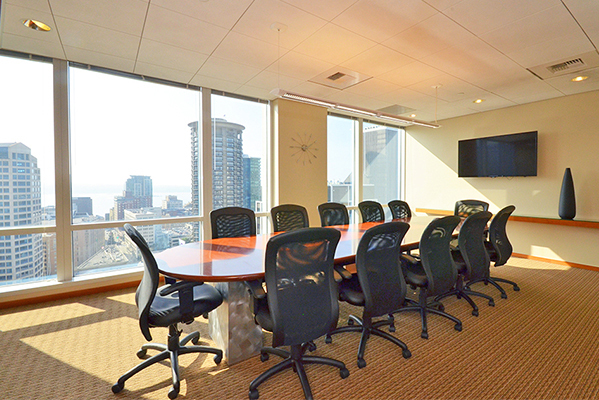 For companies in or around Seattle that don’t need full time office space, but still want to maintain a professional image, Premier Workspaces also offers virtual office plans, which provide a professional business address, mail handling, personalized phone answering and access to a conference room. Premier Workspaces offers executive suites and meeting rooms, and we can also provide our team of skilled professionals who are ready to take care of your secretarial, administrative, and information technology needs. You don't have to be a large corporation to enjoy working in a world class corporate environment. Our Seattle Downtown location is able to offer immediate occupancy, which means that if you sign a contract in the morning you can be sitting behind your new desk getting work done that same afternoon. Premier Workspaces is one of the largest privately held providers of office space, executive suites and conference rooms in the United States, and has grown from 9 locations to over 80 by providing office space solutions to companies of all sizes, all across the country. Contact us today or schedule a tour to learn more about our office plans and how Premier Workspaces can help your business grow and adapt effectively. Hope to hear from you today! Premier Workspaces understands your need for flexibility as business conditions evolve and your company develops. We are happy to customize a dedicated, full-time office space to meet your specific requirements and goals.Our non-branded full-service executive suites offer all the essential tools for your company to operate effectively and be successful. We provide a complete office solution, so you can focus your attention on managing and growing your business. 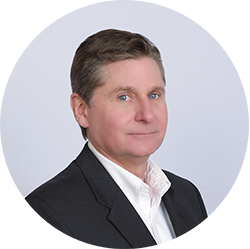 If you don’t need a dedicated, full-time physical office, but still want to establish a highly professional business presence, a Premier Virtual Office could be the right solution for you.Whether you need a full virtual office plan or just need support with mail or telephone management, we offer plans and pricing options to fit every budget. At Premier Workspaces, we have the right solution for you. Do you need a great space for holding a conference or business meeting? Premier Workspaces offers meeting rooms for rent that are suited to your specific requirements and will help you turn your agenda into reality. Our attractive, fully equipped conference rooms and business meeting rooms provide an ideal working environment. They include state-of-the-art equipment and capabilities plus free WIFI and free local and long distance calls. And all our meeting facilities come with a thoroughly trained, professional support staff. ​Whether you are presenting to one of your clients or holding an off-site get-together for your staff, our Premier Meeting Rooms or conference rooms for rent will support what you want to accomplish in a variety of ways. *Pricing & configuration varies by location. Need a professional, vibrant space? With Premier Access Memberships, you’ll get access to any of Premier's prestigious office locations at the level of usage you need. A great solution for when you just need a little coworking space time or need a private office occasionally, but want to do so in a premium workspace. *Must have Membership; cannot be used in conjunction with other discounted rates. Are your desk and your dining room table one and the same? Are you tired of meeting with clients in noisy coffee shops? Sometimes you just need a professional space where you can conduct your business. Maybe you need an office space for the day with a touch of corporate professionalism? Our furnished day office spaces are available for rental by the hour, day or week.